India's most ambitious crop insurance scheme till date is likely to be derailed in its very first phase, as states are hesitant to implement it because of excess financial burden. Launched in January to provide succour to farmers in case of crop loss or damage due to unseasonal rainfall, hailstorm, drought and other natural calamities, the Pradhan Mantri Fasal Bima Yojana (PMFBY) is being implemented for the first time in the ongoing kharif season across India at a total annual budgetary allocation of Rs 5,500 crore by the Centre. 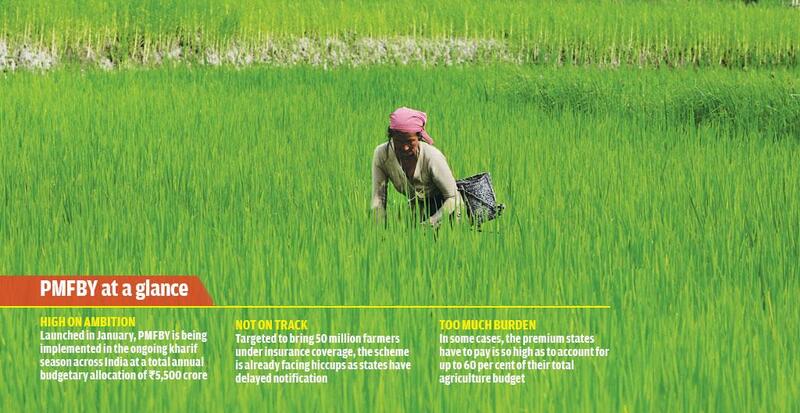 Targeted to bring 50 million farmers under the insurance net, the scheme is already facing hiccups. Under PMFBY, it has become mandatory for states to share the premium jointly with the Centre. To make it an attractive option for farmers, their contribution has been kept low and uniform. They have to pay 2 per cent in case of kharif crops, 1.5 per cent for rabi crops and 5 per cent for horticultural crops. The sum insured will vary between Rs 35,000 and Rs 75,000 depending on the districts. In some cases, states’ share of premium is so high as to account for up to 60 per cent of a state’s agriculture budget. “States are not showing interest due to the high premium rate,” P C Sudhakar, a senior officer of Agriculture Insurance Company Limited (AICL), says. A public sector enterprise, AICL offers crop insurance programmes across India. But states are unwilling to pay a high premium, hence the delay in notification. Till date, 22 states have issued tender notification for implementing the scheme. For most states, the notification was made in June-July. A few notified in August. It was late as the sowing season was over. In India, only 22 per cent farmers have crop insurance, according to AICL. For the majority of them, it was a compulsion, as the premium was deducted from sanctioned agricultural loans under the previous schemes. But the benefits under the compulsory insurance were small because the states rarely paid their share in the premium. PMFBY makes it compulsory for states to pay their share. At present, crop insurance covers only 50 million hectares (26 per cent) of the total 194 million hectares under cultivation in the country. “The government plans to increase insurance coverage by 50 per cent,” Rajeev Chaudhary, the chief risk officer of AICL, says. After PMFBY was approved by the Union Cabinet, Bihar was the only state which openly raised the issue of excess financial burden. On April 1, the Centre asked all states to close issuing notification for PMFBY by July 31. Chief Minister Nitish Kumar returned the file on August 1 that directed the state to issue the notification, refusing to implement the central scheme. After a long tussle with the Centre, Bihar finally decided to implement PMFBY on a pilot basis in some districts on August 10. “The state government has decided to implement the scheme on a pilot basis in a few districts to assess its effectiveness. Based on the feedback, we will decide about its implementation across the state,” Alok Mehta, Bihar’s cooperative department minister, says. The state’s premium amount for the kharif season is expected to be around Rs 650 crore, which is almost one fourth of its total annual agriculture budget (see chart). “The expected total premium amount the state has to pay for both the cropping seasons (combining kharif and rabi) is around Rs 1,300 crore, which is too high,” Pushkar Priyadarshi, AICL’s regional manager, says. The late notification and limited implementation are likely to restrict PMFBY’s reach. “The state has to bring 3.5 million farmers under insurance cover. Delayed notification may further discourage them not to go for it,” Priyadarshi adds. In a bid to lessen the financial burden, states are resorting to various tricks that go against the rules and spirit of PMFBY. Delay in notification is one such thing. Like Bihar, Gujarat also issued PMFBY notification in the middle of July. Another trick is reducing the amount of sum insured under the scheme to bring down the premium. Rajasthan and Uttar Pradesh have resorted to this. Rajasthan has to cough up 36 per cent of its total agriculture budget for implementing PMFBY. According to an estimate by the AICL’s state unit, the expected premium for the kharif season would be about Rs 1,800 crore for the state. To reduce financial burden, Rajasthan has scaled down the premium to Rs 1,109 crore. In the current budget, Rajasthan has allocated only Rs 676 crore under PMFBY. The state has also put an insurance benefit cap on farmers owning up to seven hectares of land, thus further limiting PMFBY’S reach. Farmers having more than seven hectares will have to bear the entire premium amount. Among the states, Rajasthan has the highest premium rate of 21 per cent. By paying less premium, states may shrug off responsibility, but farmers will be victims, agriculture experts say. Rajasthan has also made it mandatory for beneficiaries to share their Aadhaar and Bhamashah card numbers. Launched in 2008, the Bhamashah card was introduced to provided financial inclusion to families. This has worked in favour of the state. There are people who hold Aadhaar cards, but they are not linked to bank accounts. Also, many families do not own Bhamashah cards. Uttar Pradesh has also reduced its sum insured. In defence, Uttar Pradesh Director of Agriculture Statistics and Crop Insurance Vinod Singh says the higher premium was based on the scale of finance (SOF) method, which he termed unscientific. SOF is a method adopted to calculate the cost of crop production. It is calculated by a committee headed by the district collector and comprises bank and agriculture officials, experts from the National Bank for Agriculture and Rural Development and farmers. SoF counts the cost of cultivation on the basis of land quality and takes into account irrigation expenses and facility as well as cost of fertilizers, seeds and labour. SOF also varies from one district to another. To bring down the premium, Uttar Pradesh resorted to an earlier method, that of multiplying the average yield of crops by the minimum support price which is uniform across the country.“A committee calculates SOF. It is prone to human intervention and so it comes up with a high cost. The premium and the insured amount are thus high. Whereas the earlier method ensures a low amount,” M K Makwana, the regional manager of AICL, Jaipur, says. The Centre is, however, silent on the malpractices. In Madhya Pradesh, the expected premium amount for kharif crops is around Rs 1,485 crore, which is around 60 per cent of the state’s total annual agriculture budget. The yearly premium even exceeds it. Naturally, the government is uneasy. Speaking about PMFBY, Vinay Prakash Singh, chief executive officer of the District Cooperative Central Bank in Vidisha, says proper marketing was not done to popularise the scheme. The bank is in charge of implementing PMFBY in Madhya Pradesh. “The scheme is new and due to lack of robust marketing, the message is not reaching the farmers. Insurance companies are not engaging with non-loanee farmers. They are dependent on banks," he adds. In India, insurance companies are not encouraged to do business with non-loanee farmers, so, they depend on banks. The P K Mishra committee on crop insurance had in 2013 the adoption of the Spain model (see below) where the government-run insurance company has legal power, an AICL official says. A major problem with PMFBY is that it has shifted the unit area of the crop cutting experiment from the district and the block level to that of the panchayat and individual villages across India. Crop cutting experiments are done to estimate the yield of a particular field. As per the rule, 24 crop cutting experiments have to take place in a district and 16 crop experiments in a block for assessing the damage under the new scheme. According to AICL, there was a requirement of one million people to supervise the same number of crop cutting experiments in a given time period across the country under the old schemes. After the new changes were made, a gram panchayat or a village requires at least four to five such experiments to assess the extent of crop damage. An estimate carried out by AICL shows that the country will require four million crop cutting experiments. It will also require at least the same number of men to finish assessment within a given time frame. In view of this challenge, PMFBY mandates the use of technology, but it needs infrastructure and is still a debatable issue. The reality is assessments of crop damage are carried out by the revenue department officials who are not technology friendly. "Last year in Bihar's Motihari district, a circle inspector had to supervise crop cutting experiments at 15 places simultaneously in one day due to the absence of a few patwaris. But unfortunately the post was vacant and the experiment was done only on paper," a senior revenue department official in Bihar, says. "The scene is no different in other states. Shortage of ground staff will not make the programme effective," another official says. The story was published in the 1-15 September, 2016, issue of Down To Earth magazine under the headline "Premium hurdle"